Try Vega Antioxidant Omega Oil in salad dressings, smoothies, dips, and soups, or add it to your favorite vegetable, pasta or rice dishes for a plant-based Omega boost. Vega Antioxidant Omega Oil Blend is available in 17 fl oz./500ml and 8.5 fl oz./250 ml bottles and is dairy, gluten and soy free. As one of the three macronutrients that provide your body with energy, dietary fat gets a lot of bad press. In fact, dietary fat is crucial for optimal health—you just have to know how to choose the right kind. In general, saturated fats should be avoided; instead, choose a variety of plant-based polyunsaturated and monounsaturated fats. Polyunsaturated fats include Omega-3 and Omega-6. Specific types of Omega-3 and Omega-6, such as ALA (alpha-linolenic acid) and LA (linoleic acid) are essential because they cannot be synthesized in the body and can only be obtained from what you eat. These essential fatty acids are part of critical pathways for many biological processes. Traditional plant-based sources of Omega-6 such as olive, sunflower, canola and sesame can be refined and offer limited polyunsaturates such as GLA (gamma-linolenic acid) which can provide additional health benefits and are an important part of a healthy diet. The role of Omega-3s in supporting cardiovascular health is well-established—these fatty acids are essential fuels for mechanical, electrical and synthetic activities of the heart. Recent studies show a synergistic and complementary effect on cholesterol management when both Omega-3 and phytosterols are taken together. ry Vega Antioxidant Omega Oil in salad dressings, dips, soups, and smoothies, or add it to your favorite vegetable, rice or pasta dishes for a convenient and pleasant-tasting Omega boost. Vega Antioxidant Omega Oil Blend can be used with all cold, warm and hot foods, but should not be used for baking, frying or other high-temperature cooking. 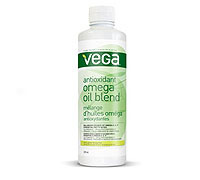 Vega Antioxidant Omega Oil Blend does not require refrigeration prior to opening because its high level of antioxidants acts as a natural preservative. Whisk together until combined. Serves 4.